WINTER DEMANDS THE BEST A COXSWAIN CAN GIVE, IN TRAINING AND IN RACING. Maybe that feeling of anticipation is masked by the wind that whips through your jacket as you head to the boathouse, the mid-winter sun low in the sky. Masked or not, it is still present, and your entire team knows it. That first race is still months away. Thousands of meters of winter training stand between you and the starting line. For now, though, as you walk through the winter wind, your race readiness gets its own time. Winter is your time to try new things, without the consequences of boats and water and docks and bridges. When your crew moves inside for winter training, head to the erg room and the tanks with them. You just got a free pass to try new calls, learn new drills, bond with your rowers and help them get to know you a little better, too. You don’t have to worry about steering or docking or oars that crab mid-piece. Sandra Chu has coxed and coached for over twenty years and shares her keys to success; we’re excited to have her join our team of writers. 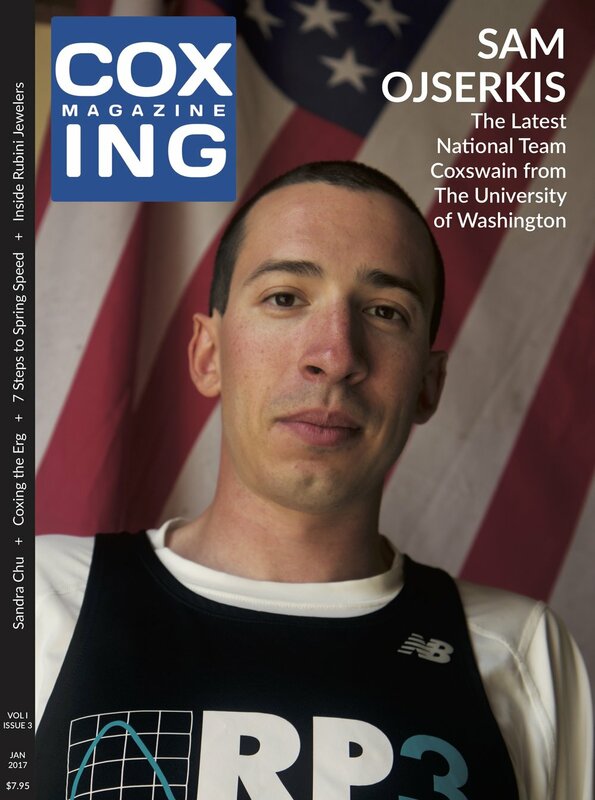 Sam Ojserkis’ experience at the University of Washington mimics other coxswains who were also Huskies: he went on to cox on the National Team. We explore the question, “What’s in the water up there in Seattle?” to find out why so many of the National Team coxswains once rowed out of Conibear Boathouse. And then, just for fun, we head into the studio of Rubini Jewelers to see the magic behind the silver and gold of rowing jewelry. As it turns out, it was the quest for silver and gold medals that launched Jaime Rubini into rowing jewelry from the very beginning. Winter is the time to connect with your team, to learn what motivates the athletes you cox, and to see them from an angle other than the coxswain’s seat. Take the time to add new calls to your repertoire and new words to your vocabulary and to gain new knowledge about the mechanics of the rowing stroke. This winter, cox an erg race or two. They’re a wonderful opportunity to focus one-on-one with an athlete. Create a race plan, learn new calls, leave the rudder behind. Coxing the erg will let you cox like you’ve never coxed before. Winter is a precious time. It allows us to focus on our calls, our teams and our fitness. Winter is a gift. Unwrap it with care; there’s more speed in that box than you can imagine.